Gimnasia Tower is in the best location in Tel Aviv and is within walking distance from: Hamedina Square, Basel Complex, Hyarkon Park, Tel Aviv museum, Kameri Theatre, City park, Rabin Square, The Beach, and Tel Aviv Port. Canada-Israel Group, Acro Group & Terra Group are in the process of organizing an investment group (‘Kvutzat Rechisha’) for the purpose of purchasing a property near Kikar Ha'Medina in Tel Aviv. The property (land) is currently owned by the municipality of Tel Aviv, with an approved urban building scheme ("Taba") for a thirty-floor tower. The property is located in one of the most thought after locations the city has to offer and as you can see from the attached presentation, the tower is meticulously planned to a prestigious standard. The presentation also includes description of the building site, floor layouts and details regarding the developers/promoters all with previous experience in high end residential developments. We intend to establish a small and exclusive group of investors, as early as possible. In light of the fact that the purchase of the property is done by a tender, time is of the essence. – A considerable advantage is that the zoning/urban building scheme (Taba) is already approved. – The bidding deadline is set to February 23, 2010. – Subject to a successful biding, it will take approximately 10 months to acquire the necessary construction permit, and thereafter about two and a half years for the construction itself. – We anticipate occupancy during 2013. Finished to high standard, designed as specious urban villas and including mini and luxury penthouses. Each apartment includes 2 parking spaces, storage and terraces with breath taking view of Tel Aviv. 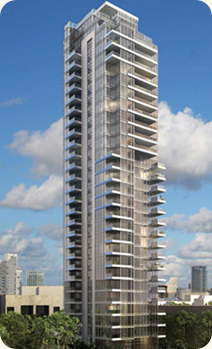 Canada Israel is a leading real estate company in Israel which was founded by Asaf Tochmeyer and Barak Rosen. The group’s activities includes land acquisition, obtaining planning consents and development executed mainly via two public companies, Pangaea RE and Pangaea Israel. The group’s geographical spread includes, Israel, Canada, USA and the Dominican Republic. Canada Israel believe in innovation, forward thinking, uncompromised quality and obligation to their satisfied clients. Their knowledge, experience and resolve have created a leading real estate company in Israel and abroad. ACRO Real Estate was founded seven years ago by Zachi Arbouve and Ilan Kipon. The company’s main activity is in the promotion and development of high quality real estate projects in Israel and abroad. 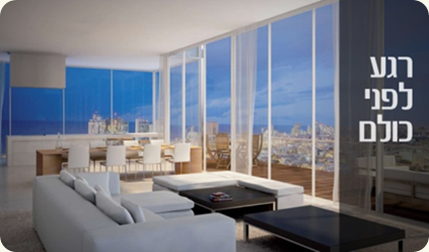 Projects in Israel include: 17 Rothschild Tel Aviv, Sea View Hertzelia, Tel Aviv Cinema, Arsoof Cliffs and others. The company believes in excellence in all areas with emphasis on design while identifying special and unique opportunities. Terra Real Estate was founded by Erez Navon and Elad Yahav. The group is dynamic and creative and is an investment house and a solid platform for investments in real estate. In its many activities the group adhere to its core principals of; extensive market research, specialisation and focus. Human resource is of great importance with the use of local players in destination countries. The group is currently active in Panama, the Dominican Republic, Germany and Poland.